See image overview at bottom! / Galerieübersicht und Artikel in Deutsch weiter unten! After playing several shows with birdeatsbaby and their charismatic and incredibly talented lead singer and pianist Mishkin Fitzgerald, Mish and I decided to make a song together. Here it comes. Patreon-exclusive release on both our profiles, but the video is now public. Get the song now! Shoplinks: bandcamp – amazon – or just become a patreon and get everything we published for as little as 1 Dollar! RELEASE PARTY with live show: March 10th in Berlin, 12Grad, Frankfurter Allee 24! See Live Shows for Details or go facebook! The story: You all know we have been discovered and supported by US producer Jason Rubal who also brought us together with Brian Viglione to play and coproduce on our last 3 records, a dream come true! (If you do not know the story read it here). When Jason contacted me first, he sent me, among others, a birdeatsbaby song he made to prove he knows what he´s doing 😀 it won me over and I became a fan! birdeatsbaby are a well establish act with 9 album releases, more than 12.000 followers and sold out shows in the whole of Europe and the US, among others with Amanda Palmer, and fit very well into our own musical universe with their line up female vocals/piano/violin/bass/drums/electronis. In 2017, another dream came true for me when Mish and I met in Edinburgh and, as she puts it in the video interview below, instantly fell in musical love with each other. The song, a duet with mythical background, references to classical music, EBM, and Goth-Rock, was released in vinyl quality exclusively on www.patreon.com/feline December 21st. The video is coming next week also on Patreon, it will be published on March 10th, from which date on the song will also be available on felineandstrange.bandcamp.com. Credits: Words&Music, Vocals, Synths, production: Feline Lang, Piano and Vocals: Mishkin Fitzgerald, Violin: Hana Maria (birdeatsbaby), Drums: Christoph Klemke (Feline&Strange). The video is a truly apocalyptic affair with a honest-to-god battle scene, featuring half of Berlin´s Steampunk scene, among others: Feuershow Ravenchild, fellow musicians Stereochemistry and Johanna Blackstone (Frank the Baptist), burlesque artist and filmmaker Viva LaMore (House of Red Doors, Full Moon Cabaret), and many more. And Mish and I are already working on new projects, and will probably share the stage a few times in 2018! Nachdem wir ein paar Shows mit den Briten birdeatsbaby und ihrer charismatischen und unglaublich talentierten Leadsängerin und Pianistin Mishkin Fitzgerald gespielt hatten, haben Mish und ich entschieden, einen Song gemeinsam zu machen. Hier kommt er, bereits am 21. Dezember als Patreon-exklusive Release auf unseren beiden Profilen downloadbar, am 10. März wird das Video veröffentlicht und ab dann ist auch der Song auf felineandstrange.bandcamp.com in Vinylqualität zu erwerben. Mehr Info auf www.patreon.com/feline . Die Story: Wie Ihr alle wißt, hat uns der US-Produzent Jason Rubal entdeckt und mit Brian Viglione zusammengebracht, mit dem wir die letzten 3 Alben in Jasons Studio in Pennsylvania aufgenommen und produziert haben – ein Traum wurde wahr! (Wer die Story nicht kennt: hier ist sie.) Als Jason mich zum ersten Mal kontaktierte, hat er mir unter anderem ein Video von einem von ihm produzierten birdeatsbaby-Song geschickt, um zu zeigen, was er kann 😀 damit hat er mich sofort überzeugt, und ich wurde ein Fan. birdeatsbaby sind mit 9 Alben, über 12.000 Followern und ausverkauften Shows u.a. mit Amanda Palmer in ganz Europa und den USA ein etablierter Symphonic Rock/Cabaret Punk Act aus Brighton, UK, und liegen mit der Besetzung Frauenstimme/Klavier/Geige/Bass/Drums/Elektronik ganz auf unserer Linie. 2017 wurde dann ein weiterer Traum für mich wahr, als ich mit Mish gemeinsam auftreten konnte und wir, wie sie es im untenstehenden Videointerview selbst sagt, uns sofort musikalisch ineinander verliebten. Der Song ist ein apokalyptisches Duett mit mythischem Hintergrund, Anklängen an klassische Musik, EBM und Goth-Rock. Text&Musik, Vocals, Synths, Produktion: Feline Lang, Piano und Vocals: Mishkin Fitzgerald, Geige: Hana Maria (birdeatsbaby), Drums: Christoph Klemke (Feline&Strange). Das Endzeit-Glamour-Surrealismus-Video entstand unter Mitwirkung von Berlins und Brandenburgs halber Steampunk-Szene, inklusive Schlachtszene, unter anderem: Feuershow Ravenchild, Musikerinnen Stereochemistry, Johanna Blackstone (Frank the Baptist), Burlesquekünstlerin und Filmemacherin Viva LaMore (House of Red Doors, Full Moon Cabaret) u.v.m. Und das ist nur der Anfang! Mish und ich arbeiten bereits an weiteren Songs und werden in 2018 viele gemeinsame Auftritte bestreiten. Here´s what we did last week! Mish was in Berlin to make the video with me! As usual, I had a TON of ideas, and props, and extras, we worked on several beautiful locations (THANK YOU!!! NISCHE of BERLINER STADTMISSION e.V. and HUNDEFREUNDE BERLIN e.V.!) and got terribly cold working half naked in sleet and frost. See the proof in the hilarious backjstage photos by me and Wolfgang Dannat (Ravenchild)! And yes, I got stuck in my dress. Do you recognise it? It´s the same model as the red one on SCIENCE FICTION! The next day, to warm up, we worked indoors with more wonderful actresses and actors on the Surreal Soiree. Third day the world exploded! We had the amazing Fire artists of Ravenchild coming in to Berlin and slay each other in an epic battle. Do you recognise the Director of Photography? It´s the legendary Damón Zurawski who already did CITY BY THE SEA. I so wanted to work with him again that I made him fly in from Stockholm for this. He stayed at our place too, as Mishkin, and we had a happy work-camping site for a few days! As he´s here, I thought, well, why not make ANOTHER VIDEO? 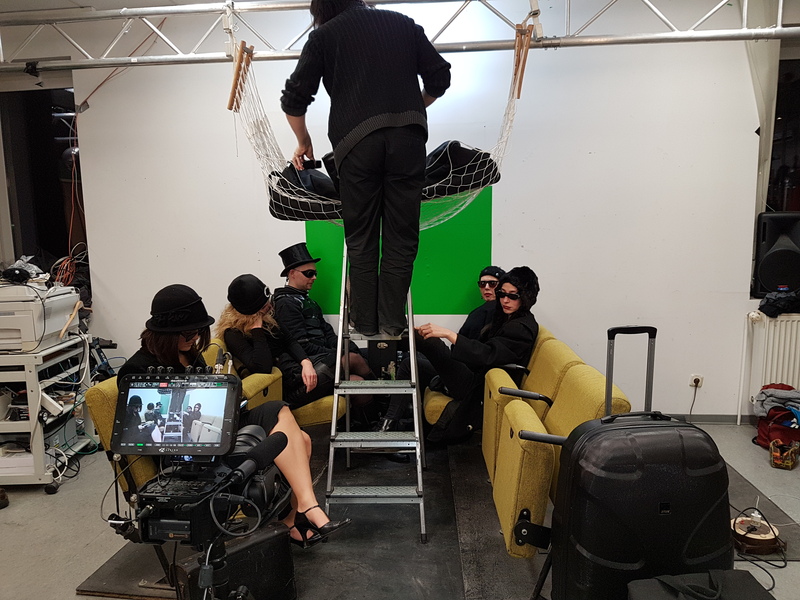 So we invited even more people to our studio, created an even bigger mess, and a little train compartment (I always wanted to make ANOTHER video involving the green folding seats from BEEN THERE DONE THAT – did you know that´s the only song I ever re-recorded in German?! ), and made a super funny very simple version of THE TRAIN. Simple YET as this will involve the first ever animation project. And cows. More soon on Patreon.com/feline! Are you curious now? I hope. Go and pledge one dollar (or more of course) on Patreon! This not only guarantees you will be among the first people to see the results, a few weeks before everyone else, but also gives you more exclusive song downloads, and what´s more: You´ll help me create more of this madness. Gallery overview. Download with right click. Credit for all Stills: Cassandra´s Twin by Damón Zurawski. Dieser Eintrag wurde veröffentlicht in A Strange Blog, Patreon, Releases, Specials. Lesezeichen auf den Permanentlink.